What did you want to do when you were five years old? I wanted to be a driver of a big red London bus. I thought that would be the best job in the world. As I got older my thoughts changed slightly. When I was seven or eight I absolutely loved mathematics, I used to long for the weekend when I could go to the shops to buy maths textbooks to keep me occupied in my spare time. By the time I was eleven or twelve I wanted to be a psychiatrist, both my parents were mental health nurses and I used to enjoy reading all of their textbooks. I was very interested in why people behaved the way they did, and wanted to help people who were finding it hard to live a normal life due to mental health issues. When I was twelve my world fell apart. My mother died from a brain haemorrhage. 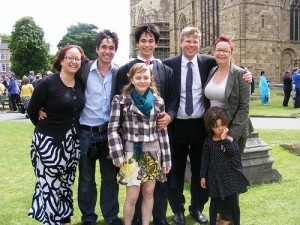 Now it was just the four of us, my Dad and my younger brother and sister. After a year my Dad remarried, we moved away and started a new life with my stepmother and three stepbrothers. It was not a good life. Emotional and physical abuse were common. I left home as soon as I could at sixteen, moved in with my friend’s family, and then after a year moved to central London on my own. I was seventeen. I worked for a few years: with refugees from Vietnam, as a student nurse and then for a record company in the accounts department. I got married at twenty and had three children by the age of twenty-three. After a couple of years at home with my children I started a ‘return to study’ course at the local adult education college. I absolutely loved it. We learnt about politics and philosophy, psychology, literature, drama and much more. I adored being at home looking after my children, but I needed something else. 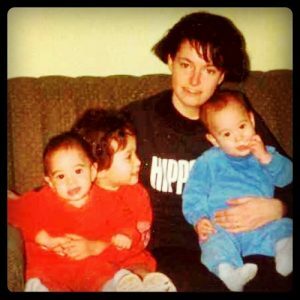 Unfortunately my ex-husband wasn’t happy with me studying, he became violent and one morning at 6am I had to flee our home with my children: my three year old daughter and twin one year old sons. We found a safe haven in a women’s refuge for six months and then moved to a new home in another part of London. My life began anew. Once we had settled I applied to study maths at a local college. They ran a course called Polymaths which ran for six hours a week on two evenings, twenty hours a week home study. If successfully completed it was equivalent to two maths A levels, sufficient for university entrance. I signed up. The first time I walked into the classroom I nearly died from shock. I had bushy dyed black hair and was dressed in a mini skirt, a black leather jacket and black Dr Marten’s boots. Almost everyone else in the class was male and dressed in a suit. I was horrified, but managed to find a space to sit down and try to contain my nerves. The teachers were great and soon put me at ease. I loved those classes. After several years of no real learning or hard problem solving type thinking my brain absolutely soaked all of it up. They became the highlight of my week. At the end of the year I came joint top of the class with another female who had become a great friend over the year. I applied to study computer science at the local university, London South Bank, and was accepted. The first year at university was hard. Classes ran 9am-6pm. I had one child at school and two at kindergarten. Their hours were 9am-3.10pm. The university was half an hour from their school, so I went to all classes that I could, which was those scheduled between 10am-2pm. Not ideal, but I was happy, learning lots of new stuff, making new friends and becoming a more confident and fulfilled person. After four years I gained a BSc (Hons) in Computing Studies and was offered a place to study for a PhD in software engineering at the same university. My dream job then was to be a consultant in the IT industry, but that would have meant very long hours and the children were still young, and I was still a single parent. A PhD was an interesting and exciting option, it also allowed me to work flexibly, take the kids to school at 9am and pick them up at the, now later, time of 5.30pm. My PhD was hard but fun. Before I finished it I was encouraged to apply for a full time lectureship at the same university, I applied and got the job. I had a salary for the first time in many years. To celebrate I threw away all our clothes with holes in them, and went shopping to buy us all new outfits. It was a great feeling to be earning a proper amount of money, to choose which food to eat rather than having to buy the cheapest of everything all the time. Finally I was providing properly for my children and taking us all out of poverty. Carrying out research for a PhD in computer science and going to academic conferences I was very much in a minority as a woman. The ratio was around 2:8 female to male, or lower, and sometimes this made things a bit uncomfortable. I remember going to one conference where, after being told by my supervisor that I needed to network at conferences, I approached a couple of guys during a break to discuss the previous session. I plucked up courage and said something friendly about the last speaker to start a conversation with them. They looked me up and down, and then started talking to each other as if I hadn’t said anything. I stood there feeling really silly, realized after about thirty seconds that they were going to continue to ignore me, and then walked away feeling absolutely mortified. I had a few other encounters similar to this, and of course some good ones too, but I never felt completely at ease in that type of situation. That was until I went to a conference in Brussels for women in science. This time there were about one hundred women and two men. As I walked into the conference room and stood looking around wondering where to go and sit, a woman came over and started talking to me. We had a great chat and joined a conversation with some other women, probably about why we were at the conference and what we hoped to get out of it. What an amazing difference. I met some truly amazing, inspiring and supportive women. That conference changed my life. I had thought that it was me, and my lack of social skills, that was preventing me from enjoying academic life to the full. Now I realized that wasn’t the case. I went home from Brussels a changed woman, and a woman wanting to help make that same difference to other women. With the help of the British Computer Society (BCS) central London branch I set up an online group for women in computing. I asked the women in the group what they wanted from it, they said “free training in internet technology” it was 1998. The BCS central London branch kindly agreed to fund this training, specifically for group members, we ran the training and it was a tremendous success. In fact, so much of a success, that we were featured in the Daily Mirror, a UK national newspaper. After the feature I was inundated with women wanting to join the group. As it was a London based group I needed to set up a national group for the BCS. To do this I had to become a chartered member of the BCS and get board level approval. This took me some time, but eventually in October 2001 (one month after finishing my PhD) I set up a national group for women in computing called BCSWomen. BCSWomen has grown in size over the last ten years, there are currently aound one and a half thousand members, who all communicate with, and support each other. I stepped down as Chair of the group in 2008, handing over to a new, younger, Chair and a very capable management committee. I’m so proud that this October BCSWomen will have been running for ten years. In 2003, while I was Chair of BCSWomen I went to a BCS meeting at Bletchley Park. Bletchley Park is the place where the codebreakers worked during the Second World War, their work was said to have shortened the war by two years, potentially saving twenty two million lives. After the meeting I went for a walk around the twenty six acre site which is now a museum. On my walk around I discovered that ten thousand people had worked at Bletchley Park during the war, and that more than half of them were women. I went away determined to highlight this fabulous contribution from more than five thousand women, and eventually managed to raise some money for the ‘Women of Station X’ project. Bletchley Park was also called Station X during the war. At the launch of this project in 2008, I gave a talk about how it came about. This was followed by a talk given by the Director of Bletchley Park. He told us about the history and contribution of Bletchley Park, the contribution of women in particular and ended with a plea for help. Bletchley Park received no government funding, money was tight, and he was worried that they would have to close. Their main income was from the money taken on the gate for museum admission and if visitor numbers dropped, so would their income. A few weeks later I was invited to a garden party at Bletchley Park. This time I went on a full tour of the site, with a veteran as guide. Standing in front of Hut 6 and listening to the veteran I had an epiphany. He told us about some of the major codebreaking achievements that had happened in the hut in front of us, and what those achievements meant. It was strong stuff. If it weren’t for the work carried out at Bletchley Park we might not have won the war. I went away from that visit determined to do something about Bletchley Park’s unfortunate situation. At the time I was head of a computer science department at the University of Westminster. When I got home I emailed all of the heads and professors of computing in the UK asking them to sign a petition on the 10 Downing Street website which asked the government to help save Bletchley Park. When I checked the online petition a few hours later lots of well known UK computing profs had signed it. Wow! They thought the same as me. This gave me the courage to take it further. A friend at work suggested that a good next step would be to write a letter to The Times newspaper. We wrote a letter and I sent that around asking the heads and profs to sign it. Within a few days 97 had signed. I emailed a few journalists that I knew with the story and twenty minutes later got a call from the BBC. A week later, on 24th July 2008, the letter was published in The Times and I was on BBC news asking people to help save Bletchley Park. This was the beginning of my campaign to save Bletchley Park, which is now saved, Bletchley Park recently announced just that. After a talk by Silicon Valley entrepreneurs in London last year I approached Google Vice President Megan Smith who had been speaking. Undeterred by my previous experience in approaching people at conferences, I asked Megan if Google would be interested in helping Bletchley Park. She very kindly asked me to email her some details which I did that evening when I got home. Google are now involved with building Bletchley Park. Earlier this month we had a fundraising garden party there which was a fabulous success. If you would like to read more about what I, and many others did and the situation now for Bletchley Park please read my campaign blog and my blog post about the recent acquisition of the Turing papers by Bletchley Park. Meanwhile, at home and work…. At home: I had another gorgeous daughter in 2004, twenty years after having my first daughter. I highly recommend a twenty year age gap between children, it provides you with great babysitters. I have also now met a wonderful man that I adore. At work: I became a Lecturer (Professor), Senior Lecturer, then Reader at London South Bank University. 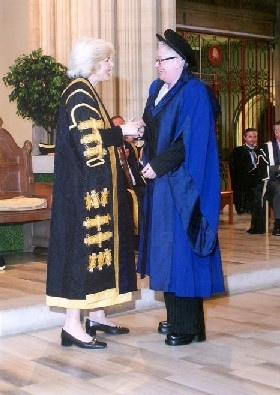 In 2007 I became head of department at the University of Westminster. I worked there for three and a half years before moving to an honorary position at University College London. I was helped enormously through this by my mentors. Over time I gradually built up a group of fabulous mentors, people who I respected greatly, with strengths in various areas, that I could have a chat with when I wasn’t sure what to do in a certain situation. We all need great people like these around us. If you don’t have a few mentors already, start thinking about who you know that you respect and admire, that might be able to give you their time. The amount of time may be as little as one hour per year, that’s what I asked one of my mentors for when she said that she didn’t have time, and then she agreed. From some very difficult circumstances when I was younger I have managed to work my way through to one of the top universities in the world. I have had many, many tough times and had to battle with all different sorts of hurdles. But I’ve made it. I try to focus on and treasure the good times and great things that have happened, rather than dwelling on the difficult times. When I feel unhappy, which of course we all do from time to time, I think about my fabulous children, and the wonderful people that I have met over the last twenty or so years. There are so many of them. For several years when I was younger I truly believed, and I was possibly right, that no one in the whole world cared about me. That was an awful thing to have to come to terms with, and especially at such a young age. But, I think that is part of what has given me the strength to do the things that I have, to keep on going when things have been almost unbearably difficult. I managed to keep myself going when things were that bad, so surely I must be able to keep going through whatever life throws at me now, right? That awful feeling of loneliness has turned around and created in me a massive pleasure, gratitude and love for people. I get so much joy from talking to people, finding out about them, their experiences, their lives and discussing shared interests and passions. Connecting with like minds. I also have a great drive to make things better. Bringing up my children mainly on my own, setting up a support network for women in tech, contributing to the saving of Bletchley Park, all of these things have given me confidence. My three older children are now all grown up and leading great lives. I’m ridiculously proud of them. They have made my life worth living. 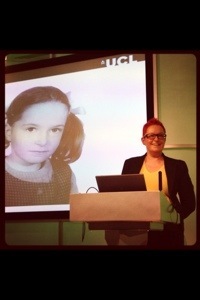 I honestly could never have imagined fifteen years ago when I was a shy PhD student, scared to talk to people at conferences that I would now feel confident speaking in front of hundreds of people, approaching company Vice Presidents and Government Ministers and appearing on live TV (OK, that one still scares me, but I do it). So I didn’t get to be a big red London bus driver, well, never mind. I got to have a great career, a great family and wonderful friends in abundance. I got all that by believing in myself, surrounding myself with people who encourage me and give me the confidence to be myself, by determination and not getting put off when things go wrong. It’s been a very long road for me, but the ups have been far more than the downs. So please, be good to yourself, surround yourself with people who appreciate you for who you are, realize that we all have bad days, we all have bad things happen to us. Keep going, keep jumping those hurdles, making things better, enjoying your life. Thank you so much for sharing this, Sue. It is an amazing story and truly inspirational. Lang may yer lum reek!